Home Business Economy & Politics The UK’s Gig Economy: Why Is It A Problem? The UK’s Gig Economy: Why Is It A Problem? Over the past few months, criticism has been increasing through the UK job market over the so-called “gig economy”. With the UK focused on Brexit, many financial minds in the country have been obsessing over how robust the floundering economy as a whole can be, as they prepare to enter an incredibly turbulent period. On the surface, everything looks fairly decent. Spending is down and growth is slowing for the UK, but it’s far from the immediate and catastrophic recession that many predicted a year ago in the wake of the Brexit vote. While it’s largely expected that things will get worse before they get better, there is still one great bastion for those who insist Brexit has been nothing but a good thing: the unemployment number. The level of unemployment is usually a big signifier of how well an economy is performing. For the UK government, the current unemployment is an outrider, the one positive speck of financial hope in the midst of an otherwise unclear picture. The percentage of people who are unemployed has been primarily falling since 2012, with 4.5% the most recent figure, the same as the USA. So what’s the problem? The more people employed, the higher the tax take, people spend more because they are earning, thus the better the economy will perform – right? The problem comes with how people are technically defined as in employment. There has been a huge leap in insecure work in the UK, i.e. people who are defined as “self employed” who actually work for a company on a gig-by-gig basis. Uber drivers, for example, are part of the gig economy. Deliveroo is another; motorcycle riders deliver food from restaurants direct to people’s doors. There’s no hourly rate; workers are only paid on each job. From that payment, they have to be responsible for their own sick and holiday pay. They have to pay for their own insurance in case of a car or motorcycle accident while at work. They have to manage their own accounts and pay their own tax. For all this, they can also be fired with little to no notice due to the terms of employment. Capitalist economies – such as the one the UK has – depend heavily on people feeling that they have the freedom to spend money. If they don’t, the economy grinds to a halt – and there’s a sign that the UK consumer confidence is falling. This is due in no small part to the insecure nature of the work that millions of people find themselves in. Then there is also the fact that while these people may be technically employed, they’re not necessarily earning much money. The UK’s personal income tax threshold is £11,500, so while many people may be employed, that doesn’t mean that they’re going to be paying income tax. 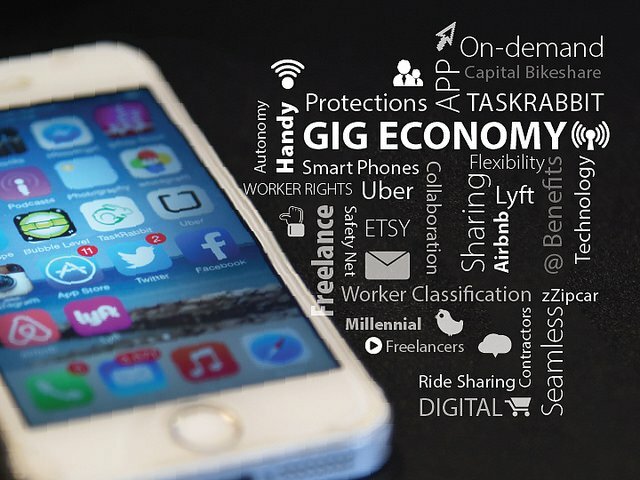 This is why the gig economy is under fire, with the UK – and other countries – examining the employment laws that gig businesses rely on to function. It seems that a low unemployment figure is far from a sign that a country’s economy is healthy, despite the fact it has always been portrayed as such.